I’m proud of myself for getting my food act together for this post! First, here’s my Chopt salad to go. 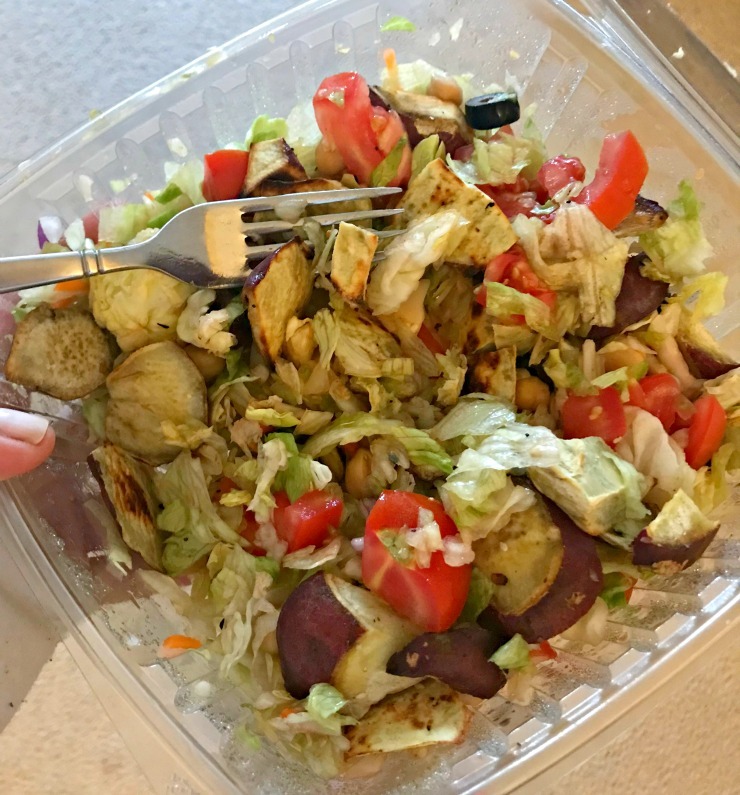 Pretty sure it was my usual mix of spinach, romaine, beets, roasted brussels sprouts, quinoa, avocado, and I think spicy peppers with lemon tahini on the side. While my Chopt salads never really look like much, I do enjoy them. 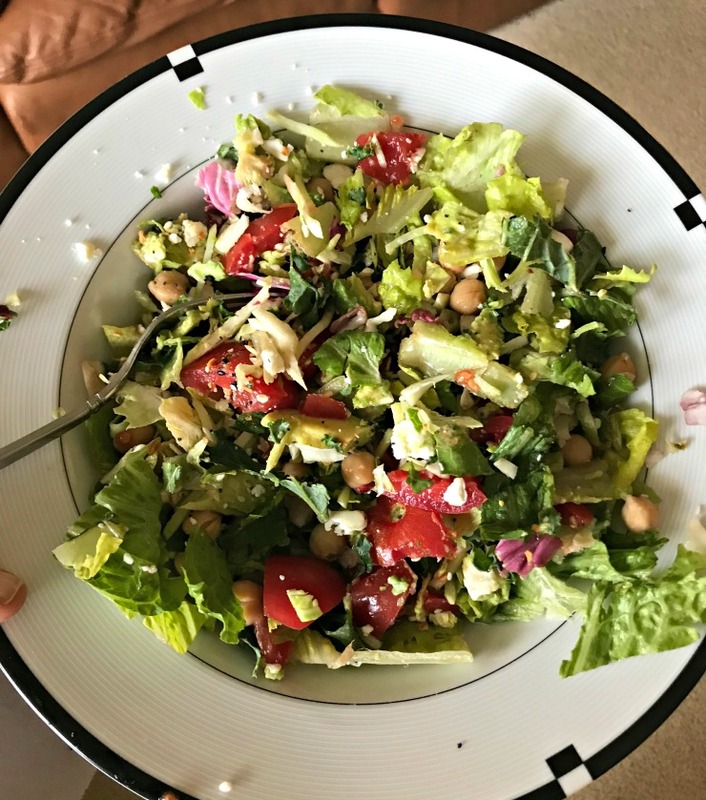 I’m still busy with my favorite salad to make at home. Tomatoes, chick peas, feta cheese, avocado, and balsamic vinaigrette. It’s so very basic but always hits the spot. I can’t make complicated salads or meals right now. Who am I kidding – I haven’t made anything complicated or involved in probably two years. 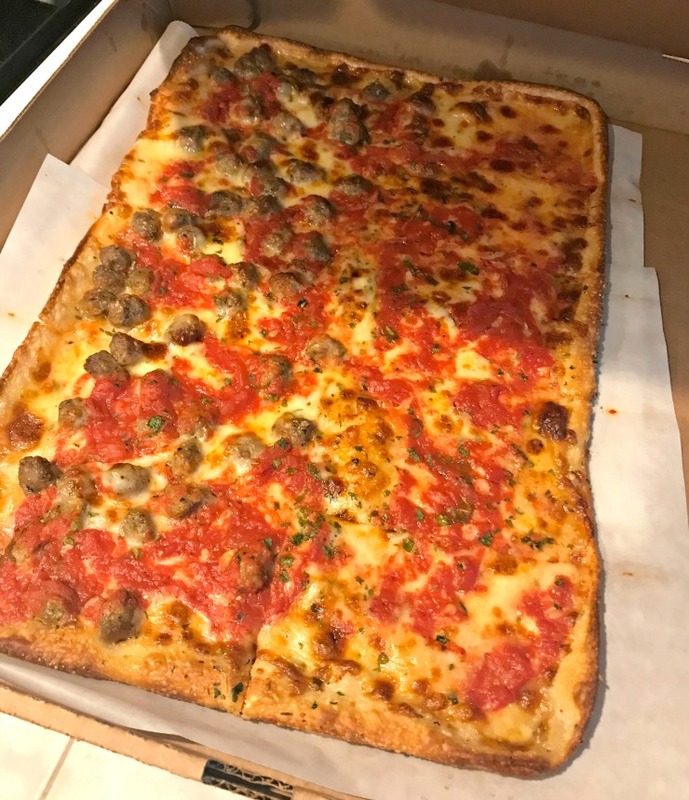 What’s a week without grandma pizza? I had leftover salad from this particular pizza night so I doctored it up for lunch the next day by adding chick peas, more tomato, and roasted japanese sweet potatoes with balsamic vinaigrette. Too bad I was out of avocado. I never do my food shopping correctly to have everything I need, when I actually need it. I went through a serious bagel and vegetable cream cheese craving craze in the last several days but have no pictures from the experience. It was a MUST EAT bagel and vegetable cream cheese situation, and let me tell you, it was so incredibly enjoyable that I wish I captured the moment. Ah well, what can you do. I can’t decide what triggered the craving although it may have been all of that nonsense talk last week regarding the way that silly person in St. Louis was slicing bagels. I can’t even get into that whole conversation because it makes me so angry (WHO SLICES BAGELS LIKE LOAVES OF BREAD?!) but I am sure you heard about it. When the craving came about, I knew it was not to be ignored. My theory with cravings is that you eat exactly what you are in the mood for, as many times as needed, until the craving goes away. I think I needed three or four bagels with vegetable cream cheese over the course of three days before the craving dissipated. That’s how to do it if you ask me. Don’t ignore the craving, honor it and enjoy whatever it is you feel like eating. And then it passes like it never happened. I bought several whole wheat bagels and bialys from my most favorite bagel store on Long Island (House of Bagels in Dix HIlls for local readers). As a side note, basically every bagel store in New York makes a great bagel. Outside of this area and, well, let’s be honest — it’s sad. Those are not bagels. Not sure what they are. Wish I could ship you all a New York bagel. However, some bagel stores even in the New York area do rise above the others and House of Bagels, in my opinion, does stand out on the more fabulous side. And their bialys? The best ever. Not sure what I bialy is? Here’s a good definition. 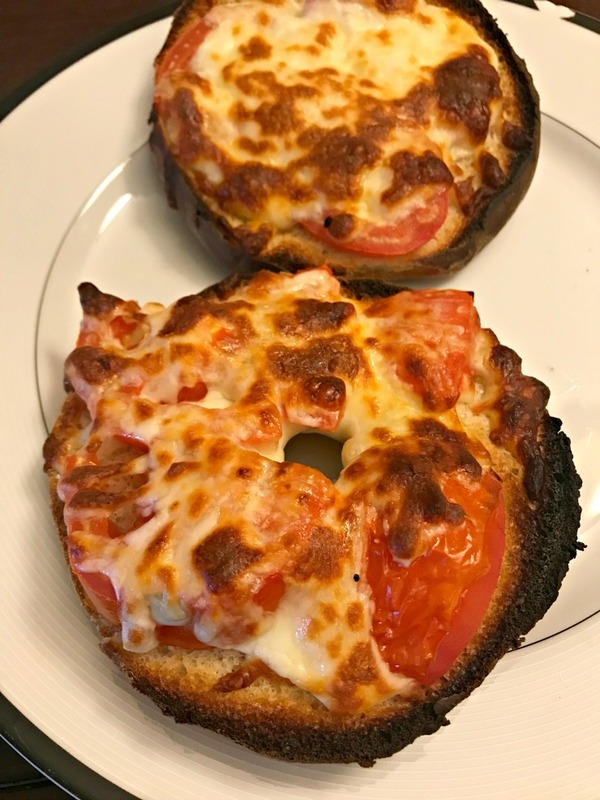 I had a bialy with tomato and melted mozzarella for dinner the other night, going a little overboard on making it well done. 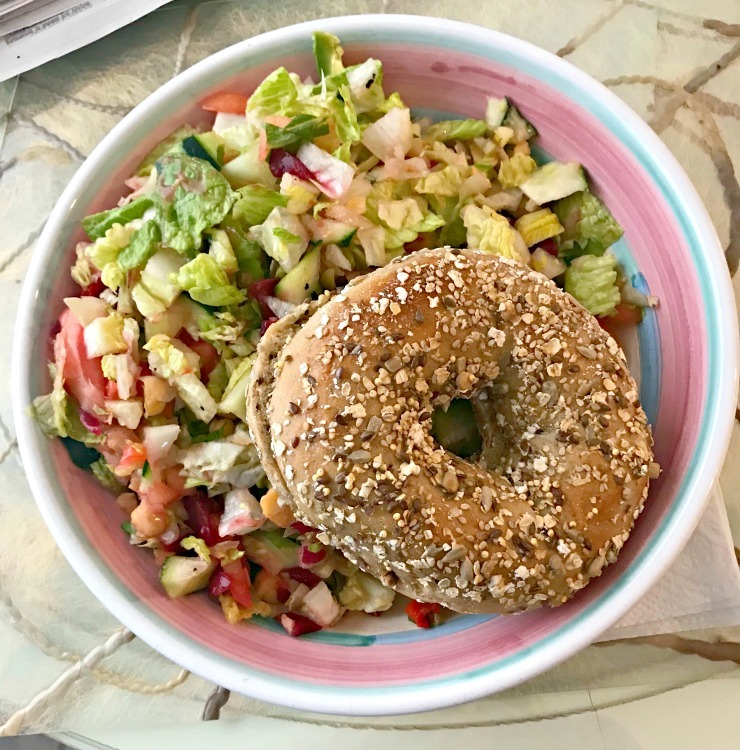 Once I was over the whole bagel with vegetable cream cheese craving, I still wanted a multigrain bagel on the side of my salad from Town Bagel. 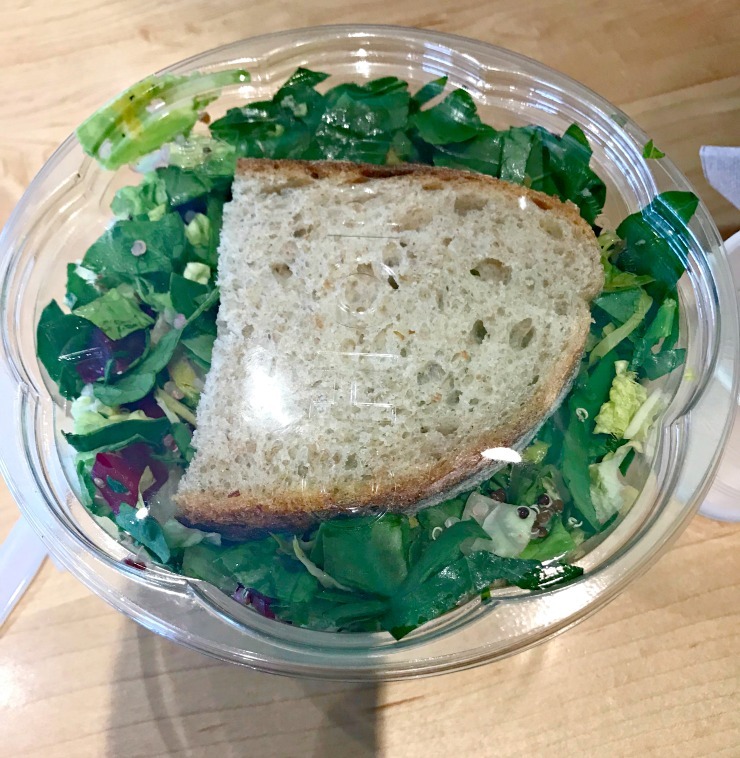 I like to pick at the bagel while I eat my salad. Two pictures because I couldn’t decide which was better to share. Did you read about the bagel slicing nonsense from last week? What is your favorite type of bagel? What about cream cheese? Do you have a favorite kind? So, you know I’m from St. Louis… I totally grew up eating bagels sliced like that. The shame! I haven’t in years because you can’t toast them properly or put lox on them that way. I’ve had a huge craving for bagels and cream cheese also recently! 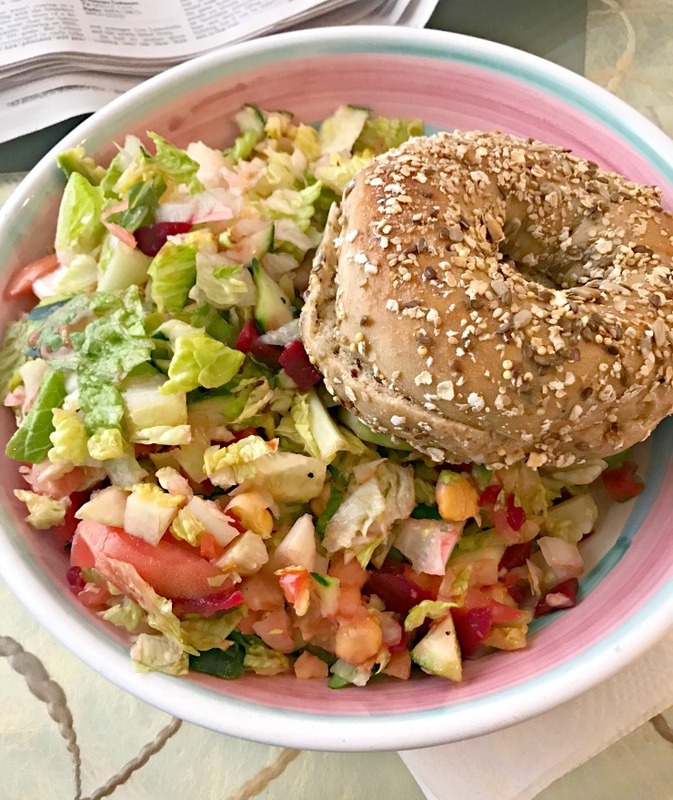 Salads and bagels are both total cravings right now for me too! I so get the ‘specific’ must be had craving that strikes on occasion, for me it’s a really good quality fresh and chewy bagel that must be untoasted and spread thick with plain, hopefully very tangy cream cheese. Happens a few times a year and always hits the spot. Usually I just go for a rye bagel toasted with avocado, love the combo.